One thing that is not ambiguous is how good the DVD image for Dillinger is Dead looks. The 1.66:1 transfer was overseen by cinematographer Mario Vulpiani and the final result is a beautifully rendered, richly realized picture. The colors are strong, equally vivid in both the light and the dark zones, and the resolution is finely sharpened. The mono soundtrack is very good. The tones are warm, and the little background details, the sounds of Glauco's nighttime activities, clearly distinguished from the near-constant music. 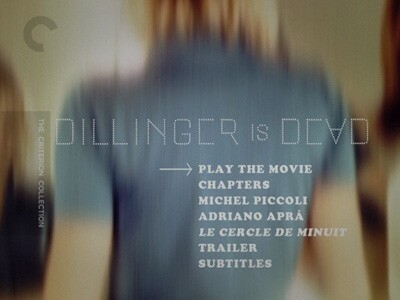 Dillinger is Dead is in French with optional English subtitles. As noted above, there is a thick booklet included with a new essay and two vintage interviews with Marco Ferreri. There are also photos, chapter listings, and credits. First up are new video interviews with Michel Piccoli (12 minutes, 48 seconds) and Italian film historian Adrian Apra (20:51). Piccoli speaks of great affection for the director, with whom he made six films, Dillinger is Dead being the first. He speaks eloquently about what drew him to this project in particular and Ferreri as an artist overall. Apra talks about the historical significance of the film, both in terms of cinema and of the social conditions that spawned it, as well as the greater impact of Marco Ferreri's career. In addition to these pieces is a 13-minute, 14-second excerpt from a 1997 discussion about Ferreri featuring directors Bernardo Bertolucci and Francesco Rosi, amongst others, and peppered with clips from interviews with the late subject, who had died just prior to this sitdown at Cannes. Lastly, we get the movie's theatrical trailer. Saying that a film isn't for everybody is a cheap and overused critical ploy, and one that would have more meaning if it were saved for movies it truly describes. Dillinger is Dead is one of those movies. I have a hard time knowing who it's for, actually, my guess is that it appeals to only a scant few--all of whom I would imagine would strongly disagree with everything I've written here. And good for them. I'm sure the one thing we could agree on is that you should Rent It and see if this obtuse, surreal exercise in cinematic rigor is for you. Find out for yourself if you're one of them, or one of me.